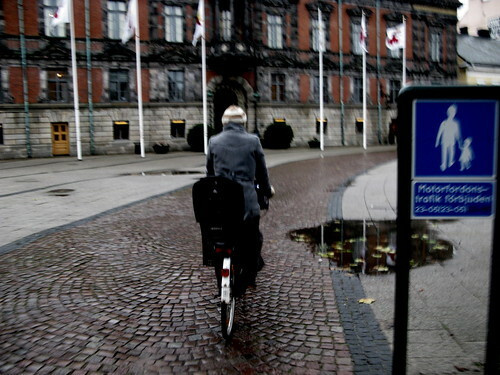 Cyclist in Malmö, Sweden. Couldn't swing a photo from Göteborg, so this will suffice. I found this the other day. Cracking good read. An American chap working in Göteborg [Gothenburg], Sweden and writing a diary of his experiences cycling each day. First and foremost: bicycling in Sweden is not about a bunch of environmentally aware yuppies working hard at being pleased with themselves. Bikes in Sweden are not conveyances for spandex-coated fashion plates wearing color-coordinated jerseys and (maybe) helmets. Bicycles are real transportation for real people. Everyone rides. They're going somewhere and doing something. The idea of using a bike to make a spectacle of oneself, the life goal of most riders in LA, seems inconcievable here. Bicycles in Sweden are real transportation, not a sporty toy. Bicycling is not a "fashion sport," to use a term from the LA Times. People bicycle to work because it is the most sensible form of transportation: door-to-door, cheap, and easy to park. Because bikes are genuinely tools for transportation, not toys, people don't treat them like toys. Gone with the spandex crowd are the expensive, show-off bikes so common in the US. (Have you noticed that these pricey toys are usually ridden by people whose tails are so bloated that they probably need to call the fire department to extract their bike-seats from their asses? These characters like to brag that their bikes are eight ounces lighter than mine, but most of them could easily afford to reduce their own weight by about 800 ounces.) Most bikes in Göteborg are, frankly, in pretty bad shape. And no wonder: they are subjected to heavy use, parking in the rain, and more time spent riding them than playing with them in the garage. This was written in 1997. I wonder if he ever returned to his home country. Perhaps he is still happily cycling around the Swedish city. Whatever the case, he sure doesn't pack any punches.